Adults and children wore short sealskin boots indoors throughout the year and outdoors during summer. The hair could be left on or scraped off. Bleached seal gullets were used to make white boot trimmings, like the cuffs on this pair. Women cleaned and hung the seal throats outside during February and March so that they would turn white in the cold. Maklak – bearded seal – was used for the soles. This pair of boy’s boots is plain, without tassels or other decorations. Joan Hamilton: Manii-ll’ mana-llu maklak. Cauluni? Neva Rivers: Nayiuluni. Nauggum-am maani qiaq. Qaralirkiugaqameng, kenugutkiugaqameng makucineng imkut makliit arnutait maavet throat-aseng pimalriit kinercirluki. Kepluki. Kinerrcirraarluki kepluki, mer’mun-ll’ ekluki keniilluki augirrcilluki. Cimirturluku mer’a. (It is hair seal. (1) Seems like this part here [white strip at top of upper] is the inner layer of the intestine. When they make decorations they take the part from the stomach that goes to the throat [esophagus] and dry them up. They cut them up. After they dry it up they cut it up and soak it in water to soften it and remove the blood. Neva Rivers: Yes. Ugun kepluki [cut it this way] so you can use the seal stomach for seal oil, the anrutaa [the stomach]. Makirarrsuutekluki amrayaaqluki [they use it for a bag for gathering greens]. Instead of plastic they use that. They put their berries in there. And they pack them away [on their back]. But with this, that part [esophagus] you save it. And in wintertime they soak it in the water, scrape it out. Joan Hamilton: Scrape it clean. Neva Rivers: Yes. Put, soak them in the water, keep soaking it, and when there’s no more blood in there, they blow them up. They bring them out in the cold wind, wintertime. And they get frozen. They keep on putting snow on it. And when they are frozen up, they cut the ends, they thread them up, and they hang them up to dry. They bleach it out like that. That’s how they make all this white. These are all made from seal except for the top. That’s cloth, blue denim. Joan Hamilton: Mana taugaam mana tuntunganani. Neva Rivers: Yes, the soft part. Aron Crowell: And what are the soles? Neva Rivers: The soles are maklagaq [bearded seal in its first year]. Maklagaq are the very best to make soles. And they use maklak [bearded seal] for making a boat. Maklassuk [bearded seal in its second year] or maklagaq they use for qayaq [kayak], thinner ones. Aron Crowell: So why are the young ones better? Joan Hamilton: They’re more pliable, they’re not as thick. Virginia Minock: Easier to work with. Neva Rivers: And they don’t have that many pores. Neva Rivers: Piciatun atutuit makut, wintertime. Mikelnguum. Nunivaarmiut waten natririyunqegtut yaaqvaneng ayagnirluteng. Joan Hamilton: They started the crimping from way back [toward instep]. Further back than where they normally do. John Phillip, Sr.: Tan’gaurluurtaat, ai? John Phillip, Sr.: Qaraliinateng tan’gaurluullraat. Neva Rivers: When they get wet, we put grass [in them] to keep their shape up all the time. Suzi Jones: You put grass in to keep its shape? Neva Rivers: Mm-hmm, evegneng kevirluki kinerrciqaqaluki. Joan Hamilton: You might be wearing them this way during the day, but then every night you change them over [switch left and right boot] so that they won’t “walk away from you.” Because it’s to keep them longer, then they wear evenly. So if you switch them everyday, that way, they last longer and you don’t wear one side real fast. Tuaten umyuarteqlallruugna pivkalallruakut [I would think that is why they made us do that]. Pilugut—capakin-qaa pektellruuk [skin boots—did your shoes walk]? Virginia Minock: We used to be told to put our shoes, not this way [side-by-side from heel to heel and toe to toe], but this way [side-by-side from heel of one to toe of other], otherwise they will walk off. 1. Nayiq means “hair seal” or “ringed seal” (Jacobson 1984). Hair seals—also called true seals—refer to various types of earless seals (family phocidae) including harbor seals, bearded seals, ribbon seals, spotted seals and ring seals—excluding fur seals (an eared seal). 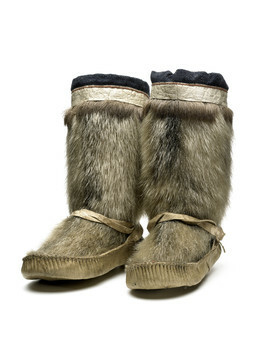 Short sealskin boots were worn indoors throughout the year and outdoors during the summer. (1) The hair could be left on or scraped off. A woman made short boots with thick soles for her husband to wear while hunting, according to Elder Annie Blue, who added that “they were as effective as today’s factory-made hunting boots, but they were light weight.”(2) Children’s boots like this pair were similar to what adults wore. Boot soles were usually fashioned from bearded seal, with finely pleated toes and heels. The soles could be replaced or patched as needed. (3) The Yup’ik name of the bearded seal―maklak―is the origin of “mukluk,” a word popularly used by English speakers to refer to Eskimo boots. In the early 1840s, Russian explorer Zagoskin recorded one traditional Yup’ik method of preparing bearded seal skins for use: “The wet hide of the seal is smeared on the hair side with fermented fish eggs, and then left, rolled up, for three days in a warm place to rot off the hair.